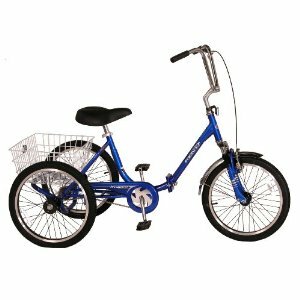 Dimensions: 58" x 26" x 42"
A strong steel frame makes this tricycle very sturdy, also mounting is easy thanks to the low step-through design. An extra wide comfortable seat and adjustable upright handlebars provide a nice ride. Linear pull brakes work great and even a suspension fork is added – don`t expect any huge difference but it softens the ride a little when encountering bumps. Also features a nice cargo basket – great for storing groceries, school supplies, library books or a small suitcase for example. The biggest advantage of Westport is probably the folding feature. 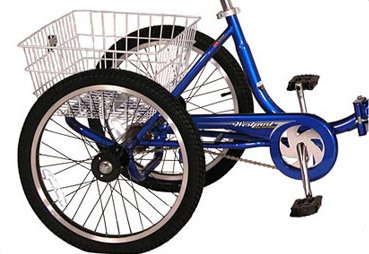 Adult tricycles take a lot of storage space so if you don`t have much of it – go for this one. Also it`s smaller than other trikes thanks to those 20inch wheels – it fits on sidewalks and pathways easily. 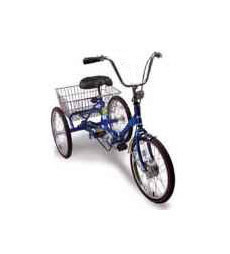 Great for children (8+ years) as well – it`s lighter than the Schwinn Meridian for example. On the other hand – with the smaller size comes a slight disadvantage: When turning quickly in higher speed it can tip over – but it happens rarely so just be careful and don`t turn those handlebars too quickly. Very easy to ride and comfortable as well – so it`s great for everybody: seniors, people with some kind of balance or motoric problems, older children and so on. It has no gears so it`s not meant for long trips – but completely sufficient for riding around town, to the store or just for fun in the park or neighborhood. This entry was posted on Monday, May 23rd, 2011 at 2:37 pm	and is filed under Adults, Folding.